Impressive 2 Bedroom Penthouse master bedroom with 4 posted king bed, master bathroom features a double person rain shower with generous powder room. 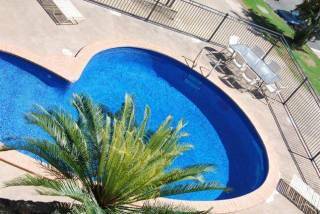 Kitchen, Lounge, Dining, LCD TV, Home Theatre plus expansive balcony complete with six person Jacuzzi. Rates are for 4 people, the room caters for a maximum of 4 adults. Impressive 3 Bedroom Penthouse master bedroom with 4 posted king bed, master bathroom features a double person rain shower with generous powder room. Kitchen, Lounge, Dining, LCD TV, Home Theatre plus expansive balcony complete with six person Jacuzzi. Rates are for 6 people. Extra adults $40.00. The room caters for a maximum of 8 adults. Adjoining Airlie Beach and nestled on Pioneer bay which features pristine turquoise waters surrounded by breathtaking rainforest, guests can expect a high level of privacy coupled with exceptional unobtrusive personalised service. The luxury retreat comprises an exclusive collection of just five, one bedroom spa suites and an incredible top floor penthouse, with views over Port of Airlie and the Coral Sea. The luxury spa suites feature contemporary inspired interior furnishings that exude style and tropical ambience, natural timber louvers, spacious balcony with corner spa, Brand new king size beds, gourmet galley kitchen and pebbled ensuite bathrooms. The penthouse features a unique four posted king bed, the master bathroom featuring a double person rain shower, generous powder room complete with private balcony over looking lush rainforest, a gourmet kitchen, black marble bar complete with wine fridge and stainless steel fixtures. Externally the penthouse enjoys an expansive balcony complete with six person Jacuzzi. Redefining intimate levels of service suites are serviced daily whilst the retreat boasts a private sun deck, deep water horizon pool, guest BBQ, lush tropical gardens, a-la-carte in room massage, facial and beauty treatments, unlimited FREE wireless internet, tour booking desk, great barrier reef touring, concierge and personalised limousine transfers. PLEASE NOTE : For the enjoyment of all guests, Waterfront Whitsunday Retreat 18+ enforces a strict NO NOISE NO PARTY POLICY. Deposit equivilant to the first nights accommodation applied at time of booking, once deposit applied booking is confirmed. Please settle your account on arrival. Please note AMEX attracts a 2% surcharge. 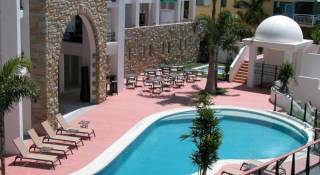 Advance Purchase / 74 Hour Sale deposit equivalent to the total accommodation applied at time of booking, once payment applied booking is confirmed. Please settle your account on arrival. Please note AMEX attracts a 2% surcharge. A credit card is required at check in as security against damage / unpaid accounts or a $200 cash bond and photo identification to be held if credit card not available. 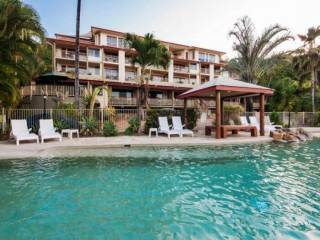 Schoolies: Waterfront Whitsunday Retreat is not part of the Schoolies program. 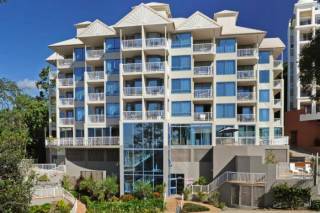 Please Note : Waterfront Whitsunday Retreat provides daily servicing of your luxury apartment. In the event of cancellation, deposits will be refunded less a $50 clerical fee if 30+ days notice is given. There will be no refund for cancellations made with less than 30 days notice. Once a booking has commenced, no refunds will be given on any unused portion of stay remaining. No Shows will result in full accommodation amount being charged to the credit card. CANCELLATION POLICY ADVANCE PURCHASE / 74 HOUR SALE : Cancellations or changes to bookings for advance purchases will not be permitted for any reason. Once confirmed a booking cannot be refunded or altered in any way.